Odette is a certified Pilates and Yoga instructor and has been practicing and teaching body-centered movement and healing disciplines for over twenty-five years. She possesses extensive knowledge in the systems of Pilates and Ashtanga Yoga as well as other movement modalities. She completed a BA(HONS) in Contemporary dance from The Place (London, England) in 1988 and continued to pursue her career in modern dance until 1996 when a severe injury sent her in the direction of healing and then teaching. 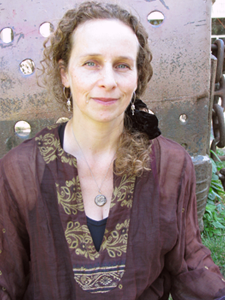 Odette has also explored the realms of Aikido, West African Dance, T’ai Chi, BodyMindCentering, Developmental Movement Patterns, Ideokinesis, Alexander technique, Feldenkrais, Cranio Sacral work, Vedic philosophy and is a level two Reiki practitioner. She credits Danny Paradise, Donna Farhi, Dona Holleman, Orit Sen Gupta, Angela Farmer, David Swensen, Lucy Martorella, Pattabhi Jois, Howard Jones, Jeffrey Armstrong, Irene Dowd and Dianne Miller among her most influential teachers. Odette currently teaches at local Vancouver Pilates studios as well as out of her home studio in East Vancouver. She is also part of a team of coaches training young triathletes at Exceleration Tri Club. She has taught at Arts Umbrella, Richmond Ballet Academy, City Yoga, Seattle World Rhythm Festival and Simon Fraser University’s School for the Contemporary Arts as a Sessional as well as Guest instructor. Odette is also a certified doula and acknowledges the profound connection between the mind and body. The people I work with include tri-athletes, medical doctors, professional dancers, musicians, physiotherapists, herbalists, doulas, and many others. Private sessions with me are available by appointment at my home-based studio where I incorporate many modalities of movement education inside the templates of Pilates and Yoga.